Remember when you learned to ride a bike? Most likely it was traditionally. 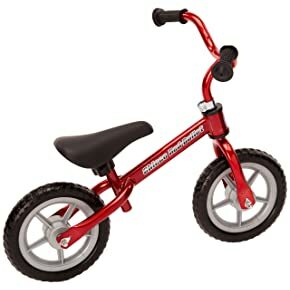 You start off with a pair of training wheels until one day your parents decided to take them off. You sat on your bike, they gave you a push, and you held on for dear life and hoped for the best. As you probably remember, it wasn’t exactly the most effective process. Well, fortunately, times have changed. There have been advances in the whole learning how to ride a bike thing. Those advances I’m referring to are a balance bike. 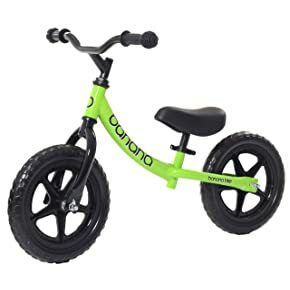 A balance bike is lower to the ground, and the tires are wide making it easier to balance. A lower center of gravity and a broader foundation makes a balance bike ideal for even the youngest of children. So, if you’re considering buying a balance bike let’s first go over how to choose the best one for your child. 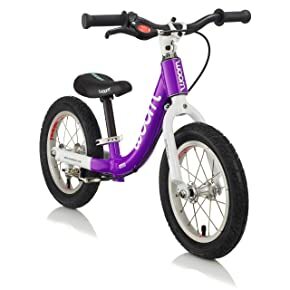 Afterward, we will discuss the 8 best balance bikes of 2019. When choosing the best balance bike for your child, we will keep things nice and simple. The key components are as followed: age range, bike type, total weight, tire type, safety, comfort, and price. So let’s go over each to help you in the decision making process. When choosing a balance bike make sure to check for the recommended age range. Some bikes have a rating as young as 18 months and as old as 5 years. The age range is based on the average weight and height for that particular age. Because of the broad age range, the balance bike will be adjustable for different heights. For example, the handlebars and seat will adjust shorter or taller based on the size of your child. These adjustments are typically made with a quick latch eliminating the need for tools. So check out the age range before making your purchase to make sure it’s the right bike for your little one. There are two different types of balance bikes. One with pedals and one without. Naturally, balance bikes WITHOUT pedals are ideal for younger riders, and balance bikes WITH pedals are the next step up. It’s also important to note that balance bikes without pedals may have a footrest. So keep an eye out for footrests if that’s a feature that interests you. The overall weight is also a factor to consider. Remember, your child will push this bike around. They will get on and off and turn it around frequently. They will also do a lot of stopping and going as they learn the bike riding process. So the lighter the bike, the easier it will be for your child to move around especially if they are younger or more petite. That’s why it’s essential to take a look at the overall weight of the bike. The lightest bike on the list below is 4.4 lbs., and the heaviest is slightly over 7 lbs. The rest of the bikes fit somewhere in between. So take a look at the overall weight if you are concerned with your child’s ability to push it around. Overall, a balance bike is a safer option in general. That’s one of the main reasons why people buy them. It’s lower to the ground and easier for a child to catch their self when they lose balance while riding. However, a few extra safety features available are brakes, handlebar pads, and puncture resistant tires. These extras are not available on all balance bikes and add some extra protection. Another component to consider is how comfortable the bike is. Some bikes had been reported having rock hard seats so pay attention to the comfort of the seat pad. Super soft grips are also available as well as air tires that provide a smoother ride. Past the seat, handle grips, and tires, there’s not much else that contributes to a more comfortable ride. Surprisingly, pricing is not too diverse in balance bikes. Price range is somewhere in the neighborhood of $50-$150. The difference in price will come from how light the bike is, the type of wheels, and the brand which makes it. But either way, there’s a balance bike available for almost all types of budgets. Now that you know how to choose a balance bike, it’s time to go ahead and pick one out. Keep reading and learn about the top 8 balance bikes of 2019. The Strider Sport is one of the best-selling bikes on the market, and rightfully so. One of its best aspects is the seat and handlebar height adjustment. That’s why it’s built for kids ranging from 18 months to 5 years old. Talk about getting your money’s worth. Your child will get 3 and half years out of it! Not to mention it’s also lightweight weighing in at 6.7 pounds. Its lightweight nature is due to its ultra-light wheels and frame. What this means for your child is easy maneuvering. When your child is learning, they won’t be just pedaling to move the bike. As you can probably imagine, there will be a lot of stopping, waddling, and pushing as your child learns to ride. A lighter bike will make the process much easier for them. This balance bike is also safe and comfortable as it comes with a handlebar pad and a padded seat. Lastly, besides its super durable steel frame, it also comes with puncture-proof tires. So that means no maintenance for you as the tires cannot go flat. A bike without tires that lose air is just one less worry as your child goes through the ups and downs of bike riding. Its users praise it for its lightweight construction. Pros – Adjustable for five different ages, multiple color options, super lightweight, fair price. Cons – Seat too hard for some, not the smoothest ride. This may be the most unique balance on the list. So unique that it first appeared on the hit show Shark Tank. The KaZaM v2e No-Pedal Balance Bike is just that, a balance bike with no pedals. It looks like a scooter with a seat that uses bike tires and handlebars. That’s because it comes with an easy step-in footrest design. The footrest design makes this balance bike best for younger kids as it gets them ready for a pedal balance bike. It’s also an excellent option for your youngest, so they can keep up with your oldest. If your 5-year-old is riding a bike already, your 2-year-old can jump on this one and have a better chance riding at the same speed. Plus, it comes with an adjustable seat, handlebars, and puncture resistant tires. This means your child’s bike will last them until they outgrow it. And the best part it’s offered at an affordable price. Its users say they love its low cost. Pros – Low cost but high value, easier to learn how to ride because of its footrest, works indoors and outdoors, durable because of its steel frame, rims, and spokes. Cons – Heavy for some, cheap tires. The very first thing you’ll notice about the Strider Classic Balance Bike is it has no pedals. This makes it perfect for the youngest of riders. The seat and handlebars adjust to heights for 18 months to 3 years of age. It’s an excellent option to teach your child to ride a bike progressively. So you may want to start with this bike, then work up to a pedal balance bike, then a standard bike. It’s also an excellent option for your youngest to keep up with your oldest. It will make them feel like a “big boy” or “big girl,” and the smile that comes along with it is certainly worth its cost. Also, it’s a simple design and only weighs 6.7 pounds so your child should have no problem pushing it around. Having no pedals is safer too. Your child just sits down and pushes off the ground. And when they lose their balance, their feet are perfectly positioned to catch their fall. Its users say they love it because it’s lightweight, sturdy, and easy to use. Pros – No pedals for easy learning, great for younger riders, super lightweight, adjustable seat and handlebars, easy to catch your balance on. Cons – Will only get a max of 2 years out of it, no pedals which is a negative for older riders. Here’s another no pedal style balance bike. It’s called the Schwinn 12” Balance Bike. 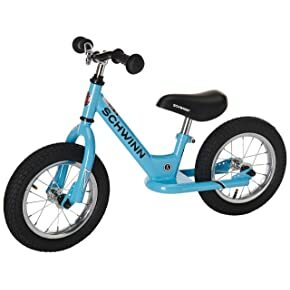 It cost a little more than other no-pedal balance bikes, but Schwinn makes it, so you know you’re buying quality. It also has a unique foot to floor frame design. So once you child pushes off the ground, they have the option to stick their feet on the frame. This makes riding a little more involved but helps with transitioning to a bike with pedals. Also, this balance bike is a little heavier and sturdier, so it’s better for a 3 year old than a 2 year old. However, it’s still definitely usable for all ages. Also, note this bike comes with air tires and tubes, unlike the punter resistant tires. This means a flat is possible, but it provides a smoother ride. Nevertheless, it’s a superior option for children taking their first step in learning how to ride a bike. Its users love it for its adjustable seat and handlebars as well as its footrest frame. Pros – Schwinn makes it, sturdy and durable, footrest frame, no pedals for younger riders. Cons – price, air-filled tires can go flat. The Banns Bike LT gets its name from its banana-like shape frame. No, it doesn’t actually look like a banana, the frame just bends inwards resembling a banana. It’s advertised as lightweight, but it’s heavier than a few others on the list. A heavier weight isn’t necessarily a bad thing, because it’s also sturdy which makes it a top choice for older riders. But still, smaller children should be able to handle it with no problem. Its users love it for its adjustable height. This way, if you have two kids, they can share it by simply adjusting the quick release seat and handlebars. Pros – Sturdy banana frame, quick release seat, puncture proof foam tires. Cons – No handlebar pad, heavy than others. 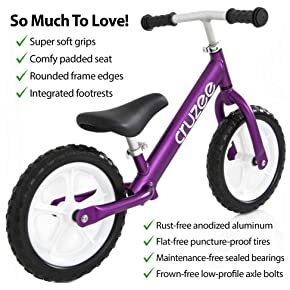 The Cruzee Ultralite Balance Bike is the most expensive bike on the list. But here’s the good news: it comes with a lifetime warranty. Not to mention it’s the lightest bike on the list. Weighing in at a super low weight of 4.4 lbs. makes it super easy to move around. It’s even more ideal for younger riders because it’s also a no pedal type. A super light bike with no pedals–that’s why it’s the best choice for 18 month year olds. It’s also incredibly comfortable as it comes with soft grips and a super comfy seat. And here’s the best part: they offer a 100% money back guarantee! So, if you or your child doesn’t love it, you can send it back and receive a full refund. It’s users like it because it’s so light that their children have no problem picking it up and moving it around. Pros – Lifetime warranty, 100% money back guarantee, super light, comfortable, low to the ground. So I must admit, I was somewhat biased when reviewing this bike because Chicco makes it. The same company makes my car seats that my family has used for the past four years. The seats are comfortable and very easy to set-up. Then I saw the low price of this bike and concluded that it’s definitely the best low-cost option available. The Chicco Red Bullet is not only an inexpensive balance bike, but it’s offered by a respectable company too. There’s not much more that’s unique about this bike. It has puncture-resistant tires, a height-adjustable seat, and it rides low to the ground so if your kid loses their balance it’s easy to catch themselves. It’s also a no-pedal balance bike, so it becomes an excellent option for that 18 month to 3 year old age range. Its users love it for its adjustable seat and wide handlebars. Pros – Low cost, good brand name, low to the ground, adjustable seat, and puncture proof tires. Cons – No pedals so will need to buy a new one when your child is ready to pedal, bolts stick out on back tires. 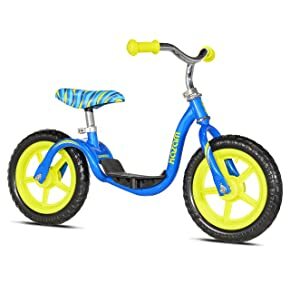 The best part about purchasing a WOOM1 is it’s the first bike of a series of six to teach your child how to ride a bike. This is their no pedal model built for 18 months to 4 years old riders. Although the next model starts at age 3, you can upgrade depending on how quickly your child progresses. Then you can save it for your younger child or sell it online and buy the WOOM2. This balance bike has a rear hand brake too so they can learn how to brake at an early age. Its users praise it for its superior comfort. Pros – Rear hand brake, aluminum frame, 1st step in a series of 6 bikes, excellent quality. Cons – High price, limited color options. 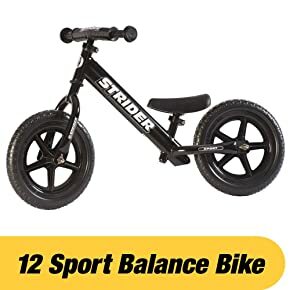 So now you have 8 of the best balance bikes to choose from in 2019. Learning to ride a bike can be tough for children. The old school training wheel method works, but as you might know, not exactly the best method out there. By using balance bikes your child doesn’t just learn how to ride a bike safely, but they can start at a much younger age. A balance bike is the new age way to learn how to ride a bike and get the job done fast.